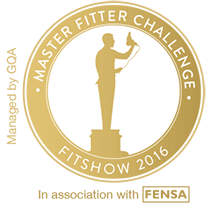 GQA Qualifications will once again lead the Master Fitter Challenge for the FIT Show 2016. The challenge – to be recognised as the best installer in the industry – has proved extremely popular at the first two FIT Shows, and this time it is going to be even bigger and better with new challenges for installers! “We are delighted to once again be leading the way in the Master Fitter Challenge” say CEO Mick Clayton. “Good installation practice is the essence of all our fenestration based qualifications and so it makes perfect sense for us to lay out the standards expected in the Master Fitter Challenge, and to be the verifiers and the judges”. “I would encourage installers across the land to get involved, it is a really exciting event and the support we offer them throughout the whole process is exceptional. Those who have entered in the past have really enjoyed it”. “Installers will be working alongside some of the major players in the industry, and fitting some of the best products there are. It is a great opportunity for them to pit their skills against their peers and to prove they are the best”.